Hey guys! This post was contributed by Anna DiTommaso from AudioTheme. I’ve recently become an affiliate of theirs. If you click through the link and purchase anything, I will receive a small commission on it at no additional cost to you. Building a killer website is a topic we’ve covered in detail here at The Music Entrepreneur, but I really like the additional insights Anna provided, and I think you will too! So, without further ado, here’s Anna! You wouldn’t show up at a job interview without making sure your resume was up to date, and proved you to be a decent candidate. Why would you approach the music world any differently? 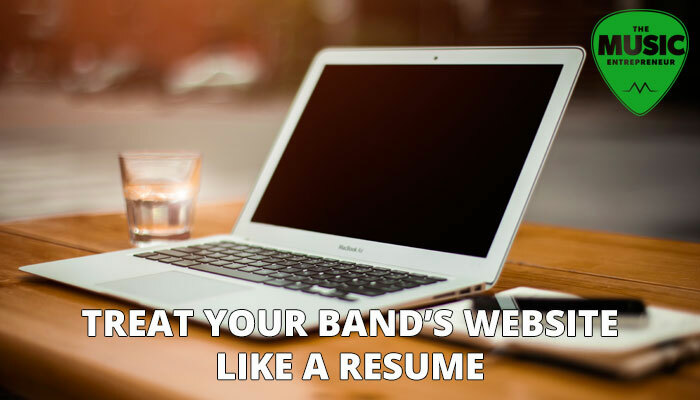 Much like a resume, your band’s website needs to prove that you are serious about your music, have experience in your field, and are a professional who is enjoyable to work with. Here are a few ways to ensure that you are making the right impression. Do you already have a following? Is your band just getting going and starting to book gigs? Are you trying to land your first big show, or sell copies of albums? Your goals will determine what information needs to be on your site. Just like you would fine-tune your resume for the current job you are pursuing, your website should change as your music career evolves. Once you’ve decided what the goal of your site is, you’ll have a better understanding of what kinds of content should be included and how it should be presented. Streaming music is one of the main reasons anyone will visit your site. Whether they’re trying to see if you’d be a good fit for their venue, or a potential fan who is hearing your stuff for the first time, you want to be sure they hear high quality versions of your music. Make sure your music player is responsive and will work on all types of devices. Some great responsive players are Cue for WordPress and the Responsive HTML5 Audio Player PRO. Your fans are super pumped to see you play live, and booking managers want to make sure you’re playing on a frequent basis. Making sure you have your shows listed well ahead of the gig date gives everyone an opportunity to make arrangements to be there. Provide as much information about each show as you can: addresses, directions, ticket fees and door charges, drink minimums, and even parking situations if you can. High resolution photos are another great component to have on your site. These pictures can be used by venues to promote your shows, media members to publish articles, and fans to simply enjoy. Once you’ve covered the basics of website content, you can add a few more features that support the goals we discussed earlier. For example, if your website is aimed at proving your band would be a decent act for a booking manager to bring in, you’ll want to include some information that gives you credibility. This would include items like a list of previous shows, testimonials from booking managers, your catalog, and even some videos of live performances. If, however, you already have a fan base and are attempting to connect to those people instead, you’ll want to include some other items that help you develop an emotional connection with your audience. Things like personal blog posts, Q&A’s, and goofy photos of your band members backstage. It’s important to remember that there is no “one size fits all” content package for bands. Your website should do a great job of adapting to where you currently are in your music career, and presenting you in a way that is true to your band. This one seems obvious, but you would be surprised at how many band websites forget to place contact info somewhere on the site. Imagine acing a job interview and walking away without leaving a phone number or email address. You want people to be able to reach out to you easily. Be sure you have a valid email address or other form of contact on your site. If you have a contact form setup, make sure it’s working properly and being directed to an email address that is checked on a regular basis. Even if you have great content, if the audience can’t access or navigate the site, you’ll lose a large percentage of your traffic. There is no denying the growth of mobile web browsing, so a responsive website that will work across all devices and browsers is an absolute must. You want your fans and professional contacts to be able to access your website any time, from any device. Luckily there are several options available to musicians. One route is to forgo a website entirely and rely on third party social services like SoundCloud and ReverbNation. You can also use a drag and drop editor paired with different widgets, calendars, and mp3 files, and try to make them fit nicely into the aesthetic of your site. Or you can find an all-in-one solution that makes it easy to update your content and gives you the confidence that your website looks professional and works properly across all devices, operating systems, and browsers. AudioTheme creates 100 percent responsive WordPress themes specifically for bands, musicians, and labels. Running on the AudioTheme plugin, all of the sites allow you to manage discography, videos, gigs, and more – right from the WordPress dashboard with absolutely no coding necessary. AudioTheme makes managing your web presence incredibly easy, so you can spend more time focusing on your music.